According to Ometzberger, her love for the band program drove her to focus her efforts to make sure the band could return home after Harvey. 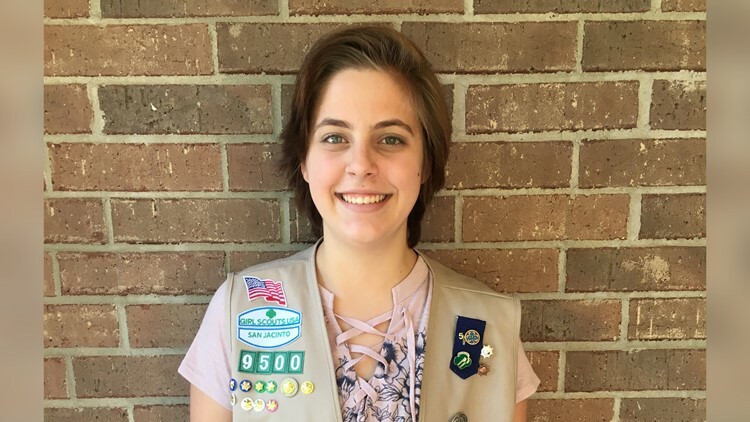 KINGWOOD, Texas – The Girl Scouts of San Jacinto says a local student is getting national recognition for her work after Hurricane Harvey impacted the Houston area. Caitlin Ometzberger, who will soon start her junior year at Kingwood High School, has become a Gold Award Girl Scout. Less than five percent of Girl Scouts ever earn the award. “The honor recognizes girls in grades 9 through 12 who demonstrate extraordinary leadership through sustainable and measurable community service projects that require a minimum of 80 hours to complete,” states GSSJ. According to the scouts, Ometzberger helped the Kingwood Mighty Mustang Military Marching Band after Harvey. She and 35 community volunteers replaced the majority of sheet music lost during the flooding and recreated the band program's solo and ensemble procedure manual. Ometzberger says her love for the band program drove her to focus her efforts to make sure the band could return home after Harvey. "My high school band family experienced a natural disaster, and I knew I wanted to help in whatever way I could," she said. "The band program has been my most enjoyable experience of high school so far and I knew that I wanted to help do whatever I could to get the band back home to Kingwood High School." She also created the volunteer schedule used to move the band back into the band hall from the temporary location at Summer Creek High School. Ometzberger completed the project during spring break, directly impacting more than 220 of her fellow students. "I am a proud member of the Kingwood Mighty Mustang Military Marching Band at Kingwood High School," Ometzberger said. "The band is my second family, and I am so happy and proud that I was able to help the band in their time of need after a natural disaster."